who doesn’t get motivated by a new dress? colleen is a facebook friend who sometimes has trouble with driving by herself. she set up a system after my visit this winter so that every time she faced that fear she put ten dollars towards a dress she and i had admired in taylorville's best dress shop. this is her birthday picture and she's wearing the dress. .. can i get an amen that she looks gorgeous??? and like she said, "who doesn't get motivated by a new dress?" we can face adversity, fear, and adverse circumstances by treating it like a game with ourselves and that’s what my facebook friend (number 298 if we’re counting) did with her fear. 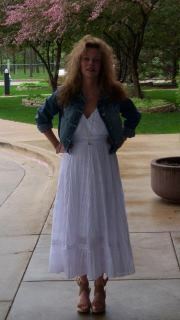 she’s now the proud owner of a gorgeous white dress that makes her look HAWT!!!! oh, and also, some pride.